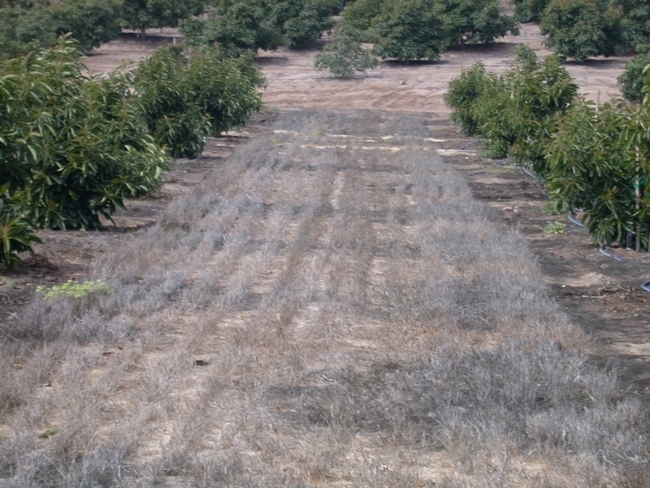 Because of potential contamination of mulches from pesticides, mulch use is being called into question and testing may be required for mulches applied to organic orchards. This is a recent ruling. As always, anything applied to a certified organic operation should be cleared with the certifier first. When Richard Smith tells you that he is impressed with efficacy of an organic herbicide you better take notice. 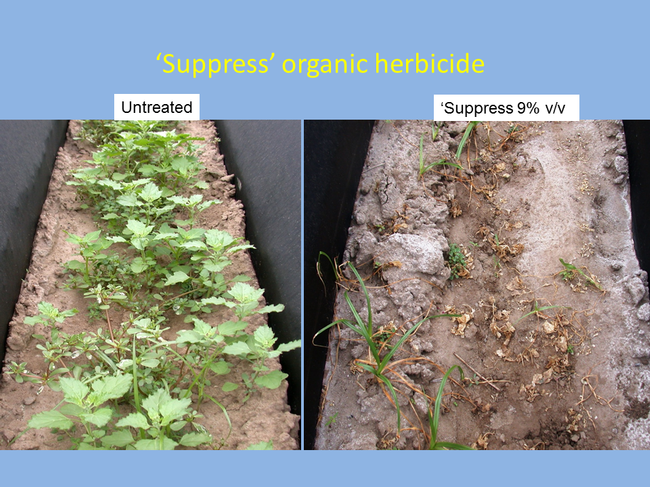 Richard shared his results on this blog site last year and showed good weed control with 'Suppress' from Westbridge. This OMRI approved herbicide is a mix of caprylic and capric acids and is a contact material that interferes with plant cells membranes causing leakage and desiccation. 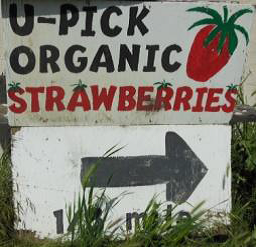 It looked like a good fit for organic plasticulture systems such as strawberry that have wet weedy furrows which are difficult to access with mechanical tools because of proximity to plastic. We placed a trial in a very weedy field that also had one of the SoCal classics–yellow nutsedge. 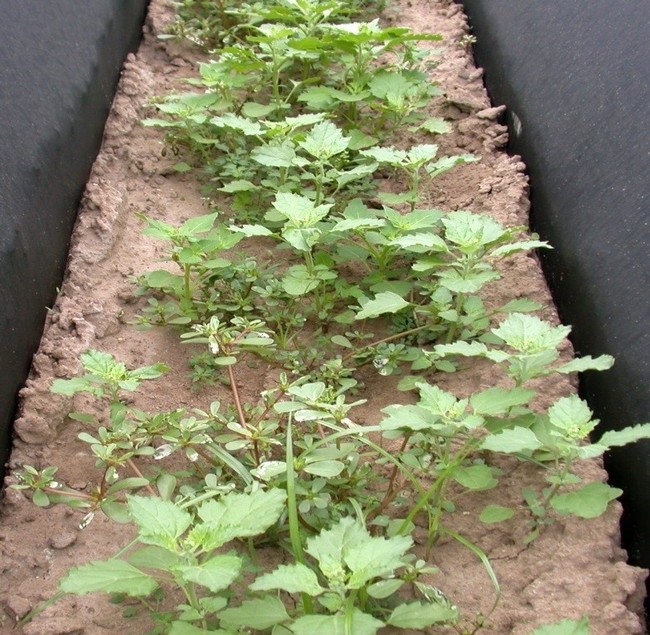 'Suppress' at 6 and 9% by volume was applied to well-established weeds just before strawberry planting. Both 6 and 9% rates provided nearly 100% control of common lambsquarter (predominant species) and other occasional broadleaved weeds. About 10-15% of common purslane plants survived and yellow nutsedge seemed unaffected by application. However, biomass of both purslane and nutsedge were significantly reduced, suggesting that production of seed and tubers for the two weed species, respectively, may be delayed. Good coverage was important and some of the horizontally–inclined leaves of broadleaf weeds likely intercepted the herbicide deposition to vertically inclined nutsedge shoots. When we simulated drift by over-spraying strawberry, it responded just like any broadleaf perennial plant—the canopy wilted and dried but in 3 weeks the new leaves developed from the crown. This was also true for the neighboring bindweed that lost above ground canopy but had new growth within a month after 'Suppress' application. 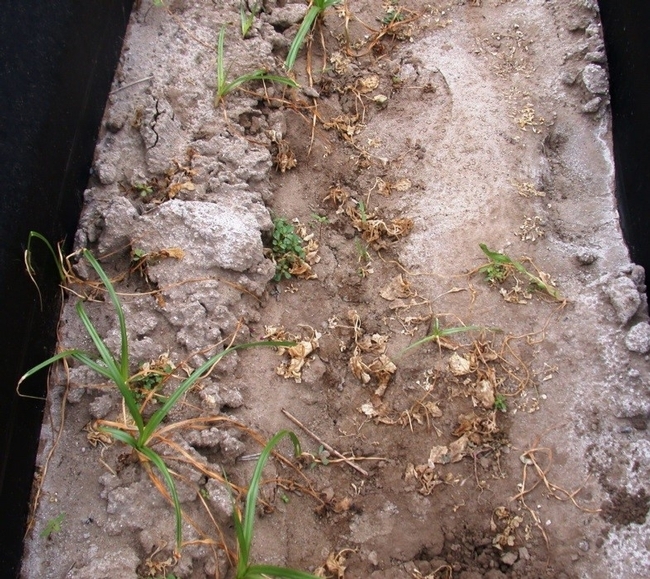 Since perennial weeds or those in soil seedbank are not controlled, repeated applications are needed with obvious caution of avoiding the spray drift to the crop. Using organic herbicides in production fields and non-crop areas. The forecasts call for rainy winter and that means a lot of weeds. During dry times perennial weeds tend to grow better than annual weeds, since perennial structures such as underground rhizomes or tubers can support them and give competitive advantage. Seed of annual weeds in dry soil may have been losing viability, senescing or eaten during this time, but many have remained dormant and look forward to the wet winter us much as the rest of us. Controlling weeds ‘organically' is always an extra challenge whether you are in a certified field or in an area where synthetic herbicides are not desired. Hand-weeding, already expensive, is even a greater burden with limited labor availability, and frankly not much fun either. Of course sanitation and prevention, mechanical and cultural management are essential in organic systems. That requires time and commitment and can quickly become your not-so-favorite pastime. Organic herbicides have traditionally been contact materials with no systemic activity. This means that they only affect tissue that they contact and do not translocate through the plant like most synthetic herbicides. Thus, good coverage is critical for these contact materials. Many years ago the first herbicides were sulfuric acid and diesel fuel, current organic materials are often acids or oils too, although a lot more benign. Recent trials by the University of California weed scientists showed that several organic herbicides provided decent control of easy to control pigweed and nightshade when they were small. When weeds were 12 days old, a mixture of 45% clove and 45% cinnamon oil, 20%-acetic acid and d-limonene gave 61-89% control; however only d-limonene controlled 19-day old weeds and none was effective on one-month old ones. As weeds get bigger they also develop a protective cuticle that minimizes efficacy of these herbicides. This year we conducted trials with a recently OMRI approved herbicide for row crops, trees and vines that is a mix of caprylic and capric acids. 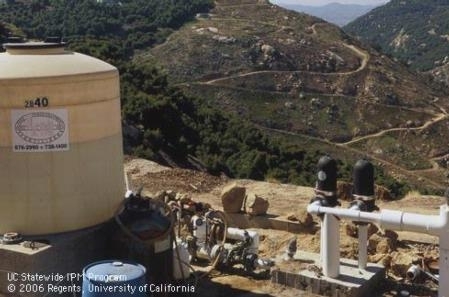 It disrupts cell membranes of plans and causes the contents to leak and plants to desiccate. It worked well at 6 to 9% by volume mixture with water and gave 90% control of little mallow and >95% of annual sowthistle compared to untreated checks. We have also tested it in organic strawberry furrows before planting the crop to prevent potential injury from drift. Furrow cultivation does not get close to the plastic mulch that covers the beds to prevent tears, so the weeds in that zone are good target for the herbicide. This fatty acid herbicide provided excellent control of common lambsquarter, reduced the growth of common purslane but didn't do much for yellow nutsedge - one of our notoriously difficult to control perennial weeds (Figure). The bigger weeds need higher rates (9% is the maximum labeled rate) and better coverage. When you have multiple layers of weed leaf canopy and diverse architecture some plants or their parts may be protected by others that intercept the deposition of the herbicide. When on target, this contact material acts fast – you can see results within 2-3 days, however, it does nothing to weed propagules in soil and has no residual activity against wind-dispersed weed seed that fly in after application. This means the control does not last and you will need additional applications or other control measures. Repeated application is not a problem in a non-crop area and is a great way to deplete your weed seedbank, but crop protection from drift, such as shielded sprayers, is necessary to avoid off target plant injury.